The Romans that lived in the Fane Road villa in Peterborough had a varied diet. They would have eaten meat form animals raised on their land as well as bread made from locally grown wheat. The excavations showed that two types of wheat (emmer and spelt) were consumed and these would have been ground into flour using quernstones. Only the upper part of a quernstone was found. 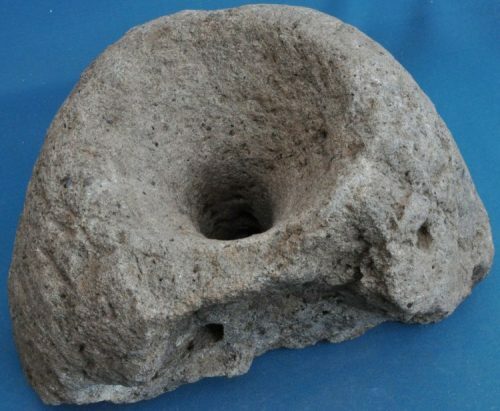 Probably made from Spilsby sandstone, it was of a type called a “beehive” quernstone on account of its shape. It was worn down on one side suggesting that it was probably oscillated rather than rotated. Grain would have been poured into the top and ground between the two stone faces. Besides eating meat (fresh, smoked and salted), vegetables (such as beans and radishes) and fruit (eg apples) the occupants of the villa would also have eaten seasonal wild berries. Environmental evidence from the excavations also tells us they ate eggs, fish and shellfish. 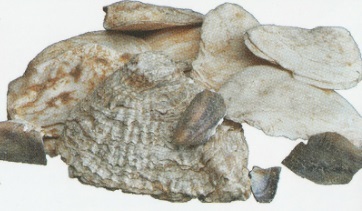 Many oyster and mussel shells were found; the former were brought from the coast in large quantities. Honey would have been used as a sweetener. 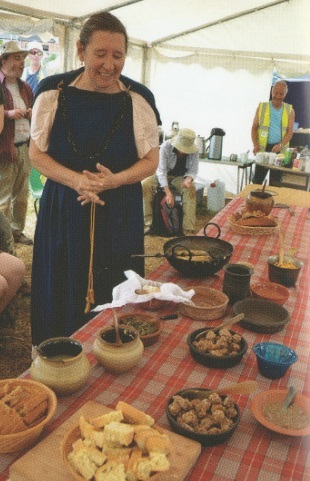 On the very last day of the Community Excavation staff and volunteers were invited to a Roman feast and enjoyed such delicacies as honey and mustard chicken, meat balls in wine sauce, garum and must cake.